Comments: It’s taken me a while to write this review, mainly because my nails, knuckles and fingers have only just grown back after our manic match at Wolves. 1 nil down, 3-1 up by half time, pegged back to 3-3, 4-3 down in the last minute, and finally level at 4-4 in the very, very, last minute. For the neutral it doesn’t get much more thrilling, but for fans of either side it was a seriously strenuous experience that’s liable to cause heart disease, post traumatic stress or lumpy undercrackers. After watching Tom Cairney unleash his inner Paul Scholes to take us into half time at 3-1, I thought it was high time to celebrate with an insipid cup of murky water and a pie. Slim pickings at Wolves meant Balti was on both sides of the coin toss. 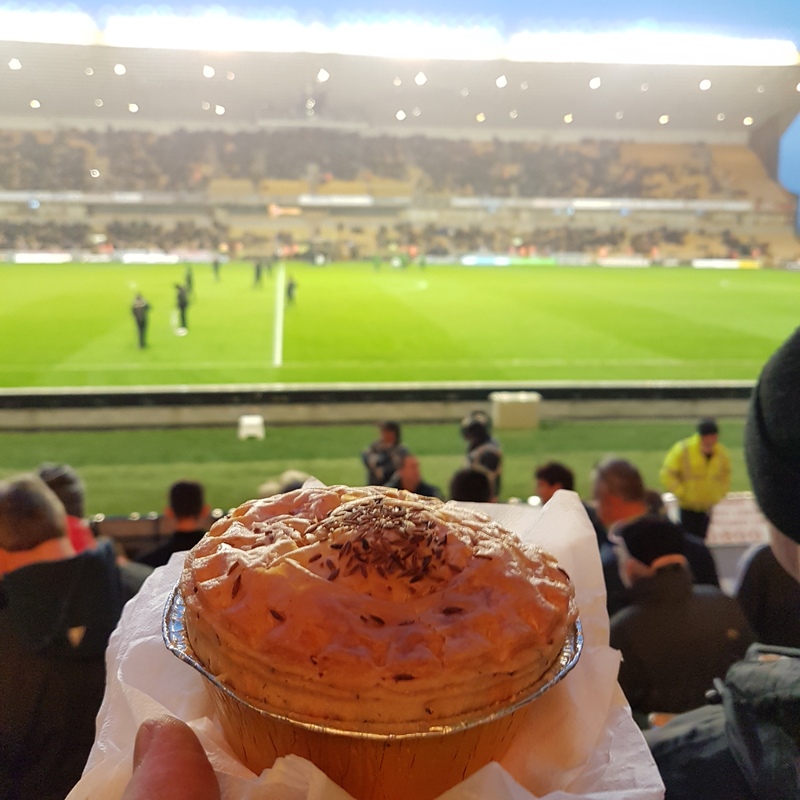 Much like Fulham’s resplendent efforts, Wolves’ pie had more puff than Sleaford Mods’ pigeon chested ranter Jason Williamson. Under the poke of a spork the pie may have deflated like the Hindenburg , but it certainly looked the business in its untouched state. The soft, flaky, roof made way for some wholesome wedges of meat doused in a deceptively spicy layering – perfect for a soggy winter afternoon in the Black Country. Some pies are about as filling as half a pack of quavers, but this brick like pie was a heavy load capable of filling the hungriest of hearts. The only drawback, and a common one at that, was the tepid temperature of its inner workings. In the bleak midwinter you need your pies piping hot infernos, not cooler than Cantona’s collar. 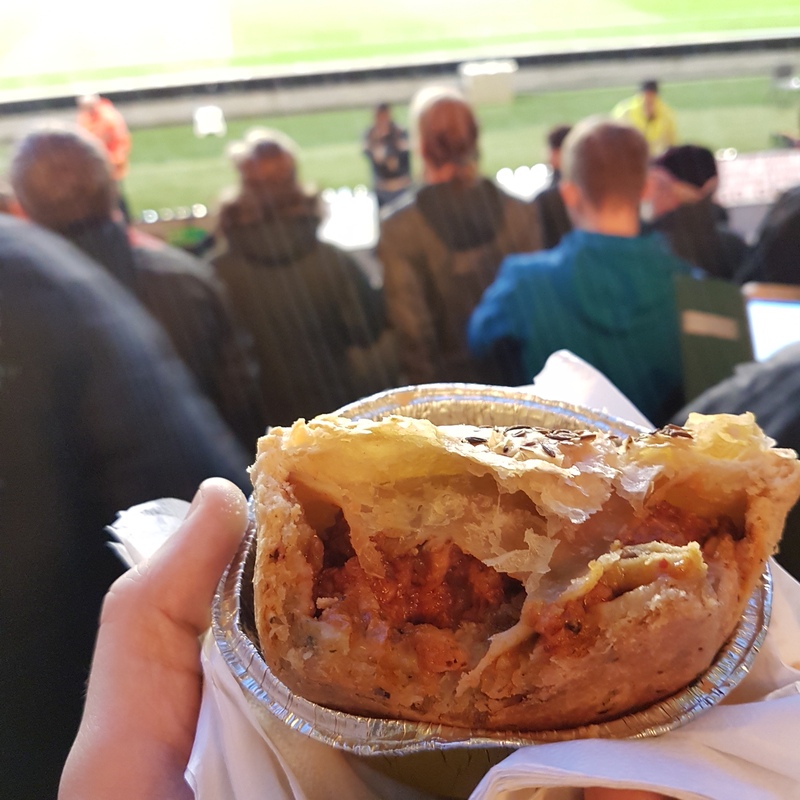 A good solid pie, but perhaps I would have enjoyed it more if Fulham hadn’t capitulated in quite such spectacular fashion…mid-table here we bloody well come.